At the end of May, my brother David and I had been working on replacing a back door on David’s residence for a few days and were ready for a change of scenery. From Vernal Utah, we south headed to Hanksville via Price Utah on May 30th. 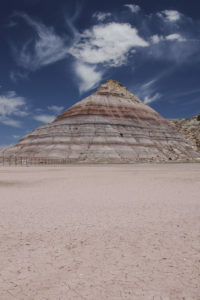 From Hanksville, we drove south on state highway 95 for twenty miles to the intersection for the Egypt area (heading west) or Cedar Point (heading east past the dry Lone Cedar Reservoir). We were heading east to the very end of the Cedar Point road overlooking Stair Canyon and the Dirty Devil River drainage. This was 10 miles of fairly well maintained dirt roads with the last few miles encountering some rocks and deep sand. 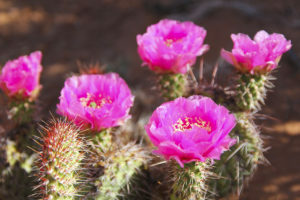 Once to the the Cedar Point overlook at the edge of Stair Canyon, it was possible to drive a short distance south along the rim before leaving the vehicle and walking the remainder of the two mile rim jeep trail. From the Cedar Point overlook, it is a vast view to the east and southeast of many canyons and buttes. In the distance to the east you can see the valleys and mesas that include Fiddler Butte and Hatch Canyon but you never do get a good view of the Dirty Devil River deep the canyon below. To the southeast, Stair Canyon Arch can be easily seen in a short side canyon of Stair Canyon. This is an impressive Class B natural arch that we had never seen or heard reported before. David was notified about this arch from someone named Hatch on David’s ‘UtahArches.com’ website. 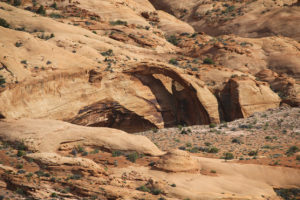 Though we only viewed this natural arch from across the canyon, it may be possible to hike to the top of the arch by dropping down to a ridge just below Cedar Point and using that ridge to bypass the head of Stair Canyon for approximately 2 miles to the arch. To access the arch from below would require a 5 mile hike and climb from Highway 95 up Butler Canyon, navigating among many side canyons to Stair Canyon and then the exact side canyon to the arch. How many dry falls might terminate this access is unknown. It was a long day drive to see this impressive arch but it was definitely worth the trip.